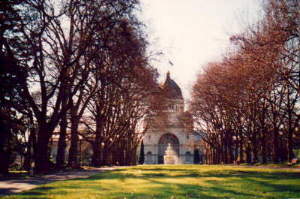 Carlton Gardens is the site of the Royal Exhibition Building which was originally built in 1879-1880 for the Great Exhibition of 1880. 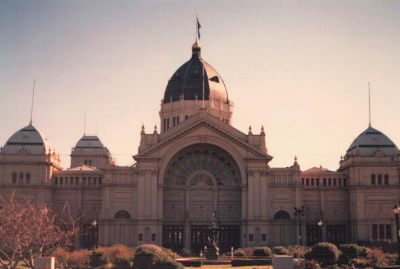 The Royal Exhibition Building (REB) was used for meetings of the Victorian Parliament for 27 years from 1901 while the Australian national legislative used theirs. When Canberra's original parliament building was finally completed it was made of New South Wales stone. 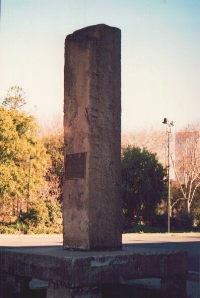 As a protest, John Woods caused this monolith to be erected as a demonstration of the beauty and enduring quality of Victorian stone (see also National Trust entry). Click here for the plaque. A modern annexe has been removed as part of the renovations. The Museum of Victoria, previously in Swanston Street, is now housed in a new building beside the Exhibition Buildings. Large exhibitions are now held in the Melbourne Exhibition Centre on the banks of the Yarra in the newly-renamed Southbank precinct. The building is classified by the National Trust and is World Heritage listed.